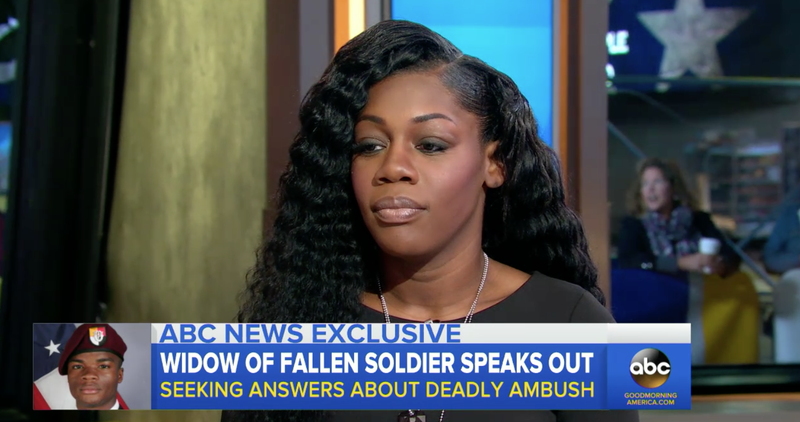 Myeshia Johnson, in her first televised interview since receiving a controversial condolence call from President Donald Trump about the death of her husband, Sgt. La David Johnson, said she wants the world to know what a great soldier her husband was—but she still has questions about her husband’s death. The Gold Star widow spoke with George Stephanopoulos on Monday morning on Good Morning America. The majority of Johnson’s interview with Stephanopoulos focused on her husband, his life and and the questions she still has about his mysterious death in Niger. In what authorities say was an ISIS-affiliated ambush that left Sgt. Johnson and three other American soldiers dead as well as five Nigerians, Johnson’s body was the last to be found—a full two days after the attack happened. Conflicting reports about the ambush have made the deadly incident the subject of a Pentagon investigation, according to the New York Times. Seventeen days after Johnson was first reported missing in Niger, the fallen soldier was finally laid to rest Saturday in his hometown of Miami Gardens, Fla.
His widow still has a lot of questions for the Army. “I want to know why it took them 48 hours to find my husband. Why couldn’t I see my husband? Every time I asked to see my husband, they wouldn’t let me,” Myeshia Johnson told Stephanopoulos, adding that the military told her the severity of her husband’s condition meant that she couldn’t view his body. She told Stephanopoulos that the military has been reluctant to share details of her husband’s death with her. “I don’t know how he got killed, where he got killed or anything,” Johnson said. Johnson also talked about the controversial condolence call from Trump, in which he told Johnson that her husband “knew what he was signing up for” and seemingly forgot La David Johnson’s name. The phone call set off a public spat between Rep. Frederica Wilson (D-Fla.), a longtime friend of the Johnson family, and the Trump administration. Johnson also confirmed that Trump couldn’t seem to remember her husband’s name until he referenced that he had his report right in front of him—“That’s when he actually said, ‘La David,’” Johnson told GMA. She pointed out that her husband was an exemplary soldier, rising quickly through the ranks. “He had high hopes in a military career,” she said. Less than an hour after the interview aired, Twitter Fingers himself took to his favorite social media platform to dispute Myeshia Johnson’s story—essentially calling the Gold Star widow a liar. When asked by Stephanopoulos whether she had anything she wished to say to the president, Johnson flatly declined. Finally, Johnson—who is six months pregnant—was asked what she would tell her unborn daughter about the father she never knew, the father who, according to the Wshington Post, had his wife’s name tattooed across his chest and had been known as the “Wheelie King” of Miami. Watch the entire interview at ABC News.